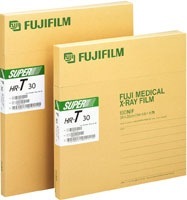 Super HR-T 30 is a high contrast film for use with green-emitting rare earth screens. It has a crisp blue tint and is well suited for general radiography and applications where enhanced image contrast and very high resolution are required. Super HR-S 30 is a medium contrast film for use with green-emitting rare earth screens. It is especially designed for easy-to-read details of the particular diagnosis such as the gastrointestinal region and the chest field. MI-DUP duplicating film provides radiographs that are almost indistinguishable from the originals. This film has excellent clarity and contrast scale, providing maximum diagnostic value. MI-DUP is coated on either blue or clear polyester base.